Owning your own business could be the biggest adventure you embark on in life! You have the opportunity to live a life that isn’t “normal” but a life that is lived on your terms. Your business could provide you the life you’ve always wanted. All you have to do is get started! We’re looking for franchisee’s who are adventurous and want to help pioneer and grow a national brand, not just become another number in a franchise system. Everything you need to start and run a business successfully can be found in our 45 year history. Along with our business and industry knowledge, we provide modern branding, proven systems, amazing marketing and ongoing support from our founders! Our undivided attention to you as a business owner can’t be matched! We want to help you become your own boss and be successful at it! We want to know what interests you about business, your personal and professional goals and what owning a Spring Touch could look like for you. Along with that, we want to tell you about our brand! We’re pretty passionate about it and our commitment can be found in our founders, the very one’s you’ll be working with! You will be individually trained and personally mentored by them, not by a general franchisee trainer. We are passionate about our brand and seeing you be successful in it! That’s why we’re looking for adventurous men and women, like us, who are ready for an adventure! Unlike businesses that are a one-time sale, the majority of lawn, pest, and sprinkler customers receive year long programs that continue year after year. Continue to grow your business and build on the work from the prior year. When you are the owner, you have more flexibility on the hours you work. You can have the opportunity to incorporate the things you love doing and and enjoy time off during the winter. Become a part of a brand with over 45 years of refined, hands-on, industry experience in the lawn, pest control and irrigation industry. Our franchisee support staff have worked in our corporate store and know exactly what it takes to operate a Spring Touch. We can help provide insightful mentoring, because we've done it ourselves! Being a Spring Touch franchisee could be the beginning of the life you've always wanted! 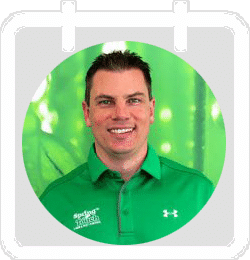 As a Spring Touch franchisee, not only will you be part of a brand with over 45 years of refinement and experience in the lawn, pest control and irrigation industry, but you will be part of a system that brings great value. From top of the line branding, cutting edge marketing programs, customer call center support, and state of the art technology; we have created a system that can help you not only succeed, but to help you scale your business quickly and efficiently. If you are looking to own a business with a commitment to cutting edge systems, experienced coaches, 12 revenue opportunities, being your own boss and customizing your lifestyle; then owning a Spring Touch franchise could be the right fit for you! Strategic marketing is critical in growing a business and we provide the best, cutting edge marketing available in our industry. Let us teach you our "One Step Sales" process and trade secrets. Never look at sales the same way again! Ensuring your customers are well taken care of is critical in providing a great customer experience and customer loyalty. Don't miss a customers call while your working or managing your employees. Instead, be able to focus your attention on growing your business. As part of your first year of franchise support, customer call center support will be included. Utilizing technology can keep you organized, efficient, and a step ahead of your competitors. It can also help you maximize your productivity and your bottom line. That's why Spring Touch is committed to incorporating cutting edge technology to help our franchisees. All of our technology is rigorously tested at the corporate location before being offered to franchisees. Owning your own business can allow you to enjoy working hard towards your goals and having built in time off. When you own your own business, you can customize your lifestyle. Imagine having flexibility, the opportunity to build a great business and to leave a legacy. The National Association of Landscape Professionals recently printed statistics from the October 2017 IBIS World market report that show the landscape services industry has annual revenues of $82 billion, and annual growth of 4.8%. Pest Control Technology Magazine Top 100 Cover Story reported the pest control services industry passed $8.1 billion in 2016, with an annual growth of 4.6%. CNBC MAKE IT. Added landscaping and pest control to a short and prestigious list of the 5 best industries for starting a business in 2017.